Fred Schaaf is one of the most experienced astronomical observers of our time. For more than two decades, his view of the sky-what will be visible, when it will be visible, and what it will look like-has encouraged tens of thousands of people to turn their eyes skyward. –David H. Levy, Science Editor, Parade magazine, discoverer of twenty-one comets, and author of “Starry Night and Cosmic Discoveries”””Fred Schaaf is a poet of the stars. He brings the sky into people’s lives in a way that is compelling and his descriptions have all the impact of witnessing the stars on a crystal-clear dark night.”” –William Sheehan, coauthor of “Mars: The Lure of the Red Planet and The Transits of Venus”In this book, you’ll meet the twenty-one brightest stars visible from Earth. You’ll learn how to find these stars and discover the best ways to see them. Each star is profiled in a separate chapter, with detailed guidance on what to look for while observing it. 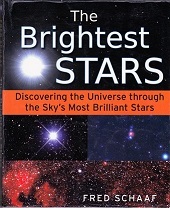 Suitable for beginners as well as experienced amateur astronomers, the book shares fascinating information about the lore and legends connected with each star through history, as well as what the science of astronomy has to teach us about the star’s physical nature.